Interest from Amazon and UPS in a freighter version of the A330neo could rekindle a competition between Airbus and Boeing as the global air-cargo market rebounds from a decadelong slump, people familiar with the matter said. Airbus is considering building a freighter version of its slow-selling A330neo widebody, spurred by requests from potential customers Amazon and United Parcel Service, according to people familiar with the matter. The interest from Amazon and UPS could rekindle a competition between Airbus and Boeing as the global air-cargo market rebounds from a decadelong slump. Production of the popular Boeing 767 freighter has been restricted as the U.S. manufacturer focuses on a military tanker variant that is more than a year behind schedule, the people said. If Airbus moves ahead, the cargo model could help lift sales of the A330neo, a re-engined version of the European planemaker’s smallest widebody, which has struggled in the marketplace. The aircraft has garnered 214 orders and lost a sale this month after Hawaiian Airlines switched to Boeing’s Dreamliner. Airbus and Amazon declined to comment. “UPS studies possibilities for acquiring new and used aircraft as a matter of routine business. However, anything you may be hearing is speculation,’’ Glenn Zaccara, a spokesman for the Atlanta-based courier, said by email. Airbus has already been exploring ways to boost sales of the A330, including a pitch to increase the jet’s maximum takeoff weight and range. Both Amazon and UPS are asking Airbus to consider stretching the A330-900’s fuselage to enable it to carry more cargo while flying a shorter range, the people said. A freight variant would be a natural advancement of an aircraft that uses the same fuselage as its predecessor, the A330ceo. There is already a freighter version of the earlier model. It garnered just 42 orders over more than a decade, all but four of which have been delivered. One issue was that the A330 freighter’s front landing gear has to be extended to overcome a tilt forward on the passenger version that complicates cargo loading. Amazon plans an initial fleet of 40 used 767 freighters for its Prime Air fleet, and has discussed ordering airplanes with Boeing in the past. The $1.5 billion air hub the company is plotting to build near Cincinnati suggests it will eventually have a far larger operation. 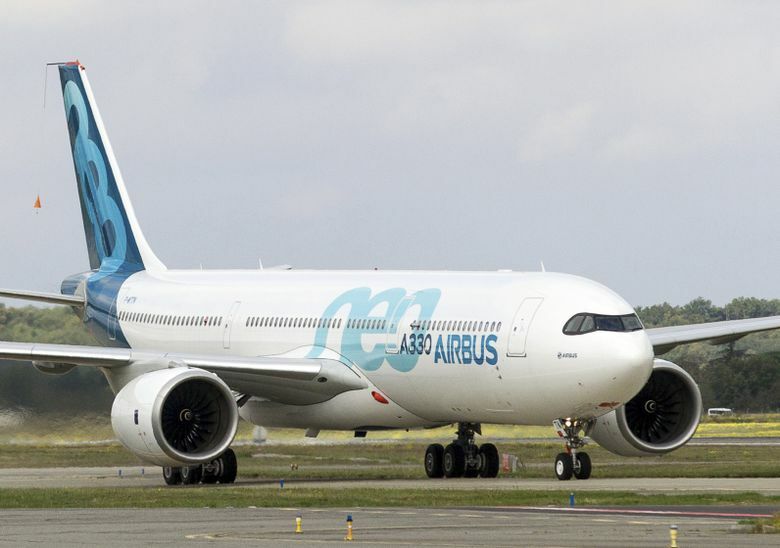 Still, it’s uncertain whether adding new engines to the A330ceo freighter would allow Toulouse, France-based Airbus to make significant inroads in a market dominated by Boeing. The Chicago-based company has logged 196 orders for its 767-300 freighter, almost five times more than the Airbus A330-200F, and has 61 undelivered planes. Cargo carriers typically value cost and capacity over performance, said Richard Aboulafia, an aerospace consultant at Teal Group. While Boeing’s freighter, at a list price of $212.2 million, is cheaper, brand-new cargo planes from both companies also face competition from inexpensive conversions from used passenger models. A wave of retired 767s and A330s provide “a lot of feedstock,’’ Aboulafia said by telephone.